» Albany briefing: Yes to what? Albany briefing: Yes to what? 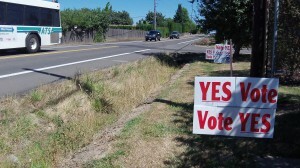 Campaign signs on Gibson Hill Road in North Albany. What are those “Yes” signs around Albany trying to say? Yes to what? To refresh your memory, if you’re a voter in Albany, no later than Sept. 3 the county clerks in Linn and Benton counties will mail you a ballot for a city election. If you want to vote you have to mail it back by Sept. 17. The issue is a charter amendment to require an election before the city government borrows money. The measure clears up an initiative with the same goal that voters approved in March. The March measure was vague in some respects, and while a plurality of voters supported it, it did not get the approval of a majority of all registered city voters, which the city attorney concluded it needed. But instead of going to court to fight over this, the initiative’s chief sponsor, Tom Cordier, and city officials worked out a new measure to clarify the first one. It spells out what kind of borrowing has to be approved in an election and makes clear that a simple majority of voters makes the decision, as in most Oregon elections. On Aug. 15, after hearing an explanation from Cordier and City Attorney Jim Delapoer, the government affairs committee of the Albany Chamber of Commerce overwhelmingly endorsed the measure by a vote of 21 to 1 with two abstentions.